Have all the Carolers already been booked? I sing with the Glastonbury Revelers. We sing madrigals and period music In costume either victorian or renaissance. We may be interested in caroling at this event… How do we become involved in this? Thanks for your note and interest. Please email christkindlmarketdsm@gmail.com with your information. As we get closer next year’s event, we’ll reach out to you. Is this really not until 2016? 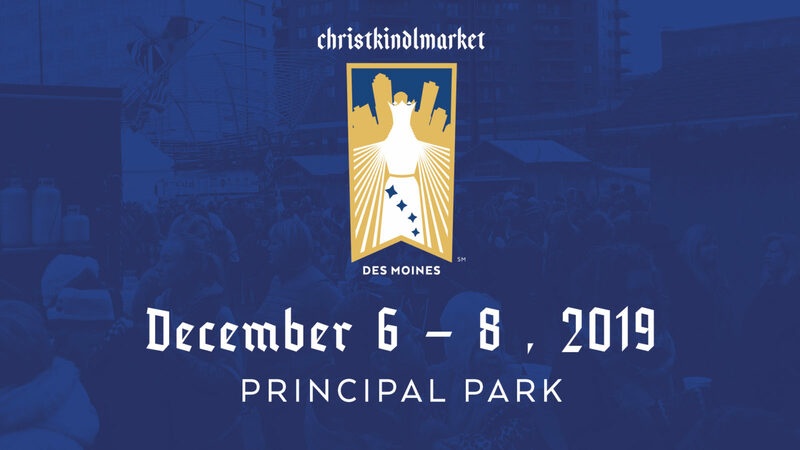 Yes, the first Christkindlmarket Des Moines will be in 2016. There is quite a bit of planning involved, so we thought we would take our time to do everything just right! Hi Doug! Thanks for your note and enthusiasm. There are quite a few moving parts to these types of events and we’re literally starting from scratch! If you’d like to become involved in helping plan the event, we would love your help! Just let us know! P.S. I’m chomping at the bit as well! Are there plans to have Glühwein and commemorative mugs? I am so happy to see this. We were stationed in Germany with the Army and we really enjoyed Christkindlmarts. I am looking forward to this event! Would there be a need for guides or information people? I am part of a VFW Auxiliary and I can ask if they would like to help out. As time gets closer and details are worked out, can you let me know what your volunteer needs are? I can forward them to the local Auxiliaries to see if we could help. I almost can’t wait for next December to get here! Also, the high schools in the area have something called the Silver Cord. This is something that high school students can earn by doing community service. I know that Waukee High School has a silver cord program, but I do not know of any others. I’ll have to look into that. Thanks for the reminder. And we are offering this event with no admission fees to the general public, so we could definitely use your financial support: http://www.christkindlmarketdsm.com/donate. Any amount helps and please spread the word! Johnston High High School participates in the Silver Cord program too. Thanks so much – we’ll definitely keep this in mind! What a great idea. I will try to visit the weihnachsmarkt with our friends from Des Moines next year. I guess there is a lot of planing before. Hi Stefan! We’d love to have you attend the event! The more the merrier! My spouse and I have been booked in past years as “Dickens style” strolling characters – we would be interested in being booked for your Inaugural Christkindlmarket 2016. Hi Lynne! That would be amazing! I’ve got your name and email address and we’ll reach out as we get closer to next year’s event. Thanks! I just sent a detailed email to the gmail address offering my help and assistance. My wife and I have visited hundreds of Germany Christmas markets over the years and are so excited about helping get this started in Des Moines. We will be at this year’s markets for almost three weeks again…can’t wait! Hi Doug – I just received your email and will respond to you there. Have fun visiting the German Christmas markets again this year!!! This sounds incredible!! Although I’m sad that there will not be one this year, I understand that in order to do it justice, there needs to be some planning. As a new resident of Des Moines, what are some other cool Christmas things to visit here?? I was getting so excited, then saw it was next year!! Can’t wait. This is a fabulous idea.